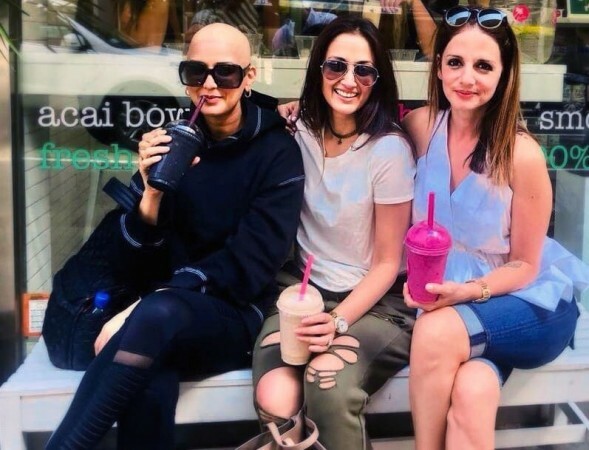 On the occasion of Friendship Day, Sonali Bendre took to Instagram to share a picture sitting alongside her besties Sussanne Khan and Gayatri Oberoi on a bench outside a store in New York. Sonali Bendre had earlier revealed that she had been diagnosed with cancer which she discovered only after it reached a critical stage. The actress is currently undergoing treatment in New York and has been keeping her fans updated with her health condition. A few days ago, she had shared a picture of her cropped hair for treatment and the Sarfarosh actress has now completely shaved her hair and gone bald. On the occasion of Friendship Day, Sonali took to Instagram to share a picture sitting alongside her besties Sussanne Khan and Gayatri Oberoi on a bench outside a store in New York. She was seen sporting a bald look and had a smile on her face. The picture was clicked by her good friend Hrithik Roshan who was earlier quite amazed to see how the family had mustered the courage to fight the emotional battle when she posted a picture with her son Ranveer. In her new post, Sonali agreed that there are moments of pain and low energy, but at the same time, she is feeling very loved and happy to spend time with people she loves. She also thanked her friends for being her pillar of strength and making her feel special by coming to visit, calling and texting her in between their busy work schedule and never letting her feel alone. P.S. Nowadays I spend far less time getting ready because I don't have to fuss over my hair! #BaldIsBeautiful #FindThePositive #OneDayAtATime." The 43-year-old actress is currently undergoing treatment for metastatic cancer in New York. On Friday, her husband Goldie Behl had updated fans that she is responding well to treatment without any complications.